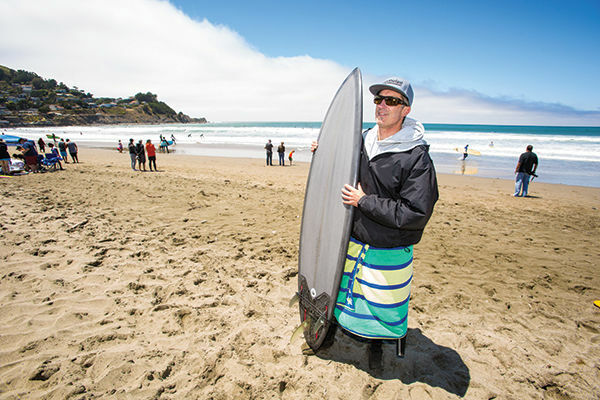 Rock ‘n’ roll reverberated as dogs roamed the beach and little girls cartwheeled on the sand under cloudy skies during the 15th annual Kahuna Kupuna Classic surf contest Saturday at Linda Mar Beach in Pacifica. The event is a fundraiser for Pacifica’s Environmental Family. Howatt was part of a six-person intergenerational team that also included brother Jackson Howatt, Colin Dwyer, Steve Dwyer, Taylor Payne and Norm Payne. The Howatt-Dwyer-Payne team was edged out for first place in the intergenerational category by the Half Moon Bay team of Clay Johnson, Kaira Wallace, Nick Holoulos, Tom Feix, Peter Andreini and Mike Wallace. In a fascinating moment, Andreini and Feix wound up riding the same wave and attempted to change boards, which would have been a neat trick. Jeff Bjork, a former Half Moon Bay resident who now lives in Marin, was also among the hardy souls who braved the cold saltwater. Spectators oohed and ahhed at impressive rides and wipeouts alike as surfboards were raffled off and mugs and T-shirts were sold. One of the contestants was Christian Wadman, of Marin County, who competed in the 40-49 age group. Roy Earnest, who presided over the competition, was pleased. Many of the competitors were middle-aged men like Hugh Gurin, of San Francisco, and probably relieved not to have to compete against 20-somethings with more agile bodies. One of the female competitors was Krista Howell, of San Francisco, who co-produced the 2006 documentary “Great Highway” about the history of surfing in the Bay Area, including the famous Coastside surf spot, Mavericks.